This art project was inspired by MCPS Art News. Students first studied the proportions if the face drawing guidelines where facial features should go. Then they practiced sketching their portraits. After students became comfortable drawing their portraits, the drew them onto black paper and outlined the pencil marks in glue. We then waited until the next day when they were dry. 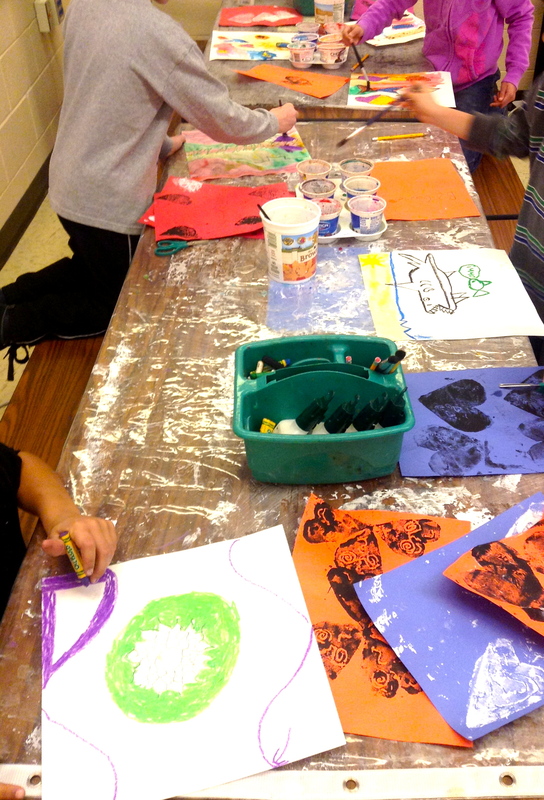 The next day, students used oil pastels to fill in the areas of the black paper not covered by glue. This gave it a sort of batik look. Some students opted for a more realistic look and others wanted their portraits to be very different or abstract even. I love all the colors in this one! Inspired by Lines, Dots and Doodles. Getting to the end of the year and students are starting to feel a bit restless. It’s time to start the ‘clean’ projects! Get out the drawing supplies! I try to save most of the drawing projects for last and do all the messy stuff mid year. For this project, 2nd and 3rd graders copied their hands and feet and drew their bodies so it looked like their bodies were farther away and their hands and feet were really close to the viewer. We learned this drawing technique is called foreshortening. This one looks like a Simpson’s character! With all of them up on the wall together, it looks like they are trapped in the school walls forever! No summer for you!